I’m in the middle of creating a wonderfully creative work space. Part of that project involves jazzing up my bulletin board (because who wants to look at a boring bulletin board all day? ), and the other part includes creating a motivational quote or two for the wall. Who doesn’t love a good motivational quote? When I was first trying to decide what quote to paint on my canvas, I found so many it was overwhelming. 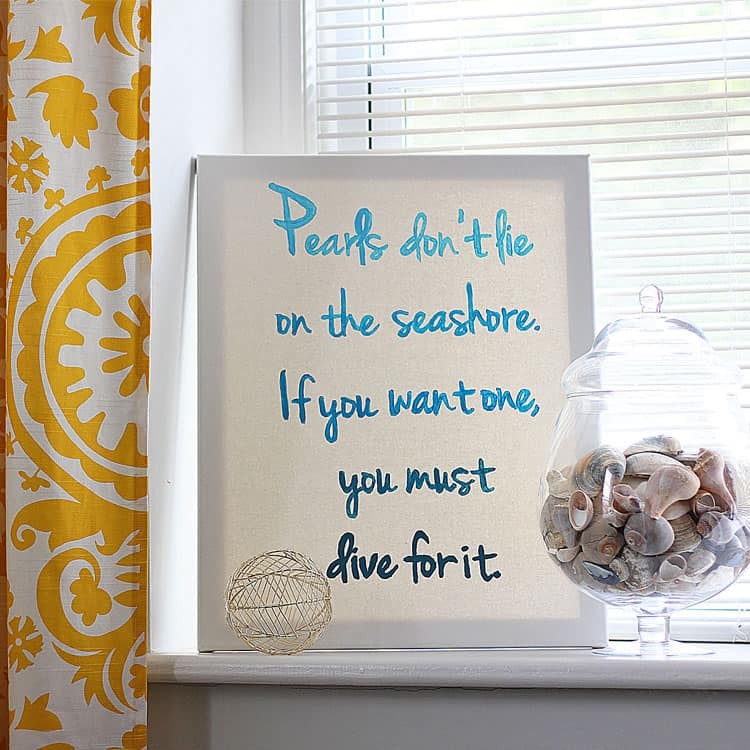 But then I came across this one: “Pearls don’t lie on the seashore. If you want one, you must dive for it.” Isn’t it just beautiful? It’s a Chinese proverb, and it has so much meaning to me, both literally and figuratively. 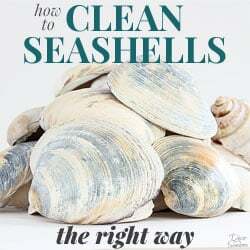 It just felt so fitting, especially since we live a stone’s throw away from the seashore. I just knew this was the quote I wanted to have hanging above my desk. 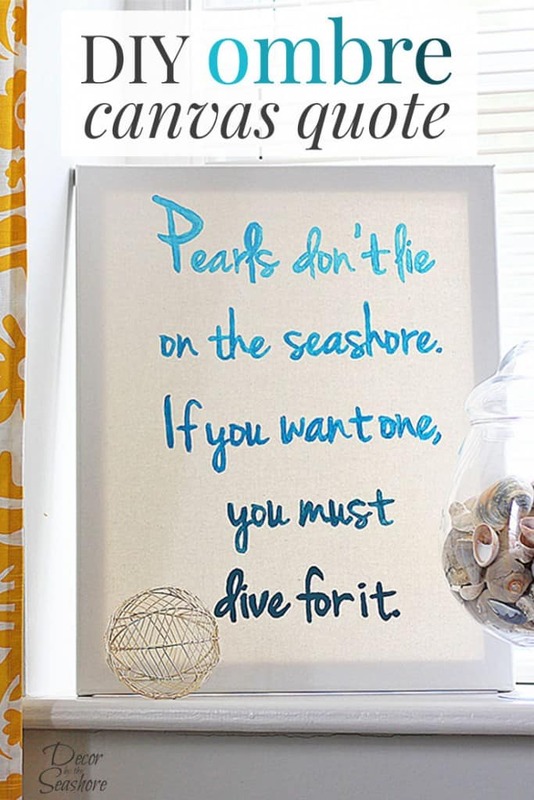 And of course since this quote was about the seashore, it was only fitting that I painted it blue. It has nothing to do with my obsession with the color blue. Really, I swear! 😉 I used black and white paint to create different shades for the ombre effect, and I think it turned out quite lovely, especially for someone who generally stays away from any sort of artistic freehand painting. 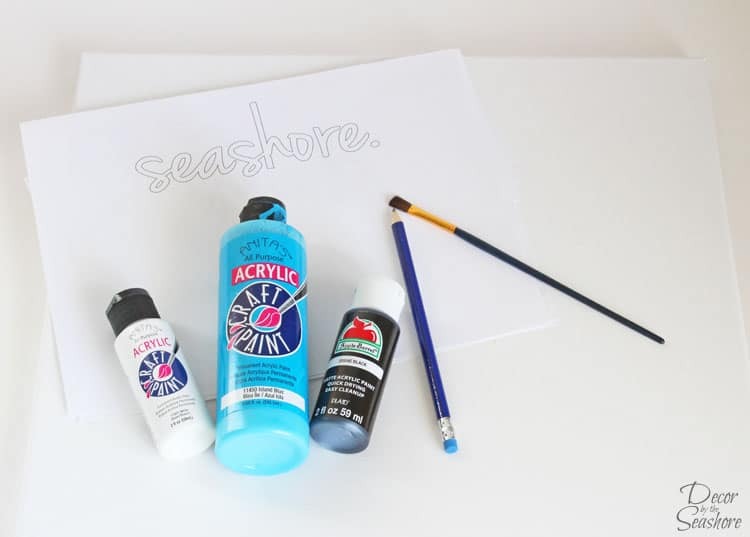 *To create an ombre effect, you can go with several different colored paints or one paint color and white and black paint to mix and create different shades. 1. Decide where you want to position the letters on the canvas. 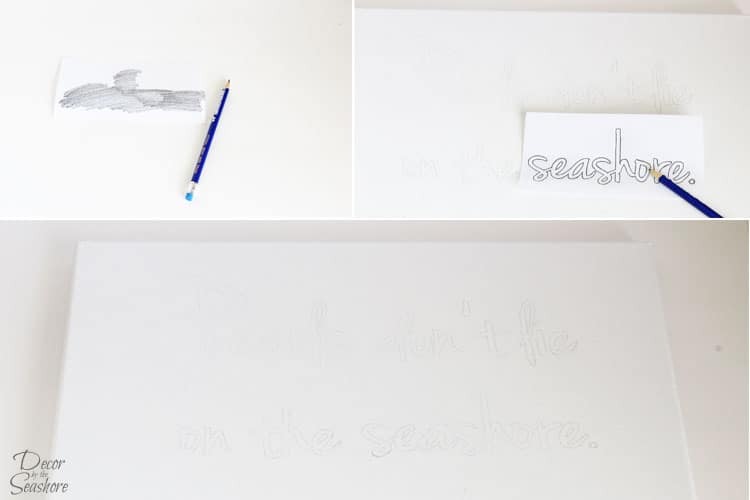 Use a pencil to lightly trace the letters with your stencil, or do what I did and print the quote out and rub the back with a pencil. Then trace over the letters on top to imprint the outline on the canvas. If you’ve got great hand lettering, you could also freehand this part. Or if you’re really confident, you could skip this part altogether and just move straight onto painting, though I suggest having an idea of how you’re going to lay out the text before beginning to paint. 2. Plan out how you’d like to create your ombre effect. I used one paint color and since I had five lines, I did five different shades of the blue by mixing in black and white paint. 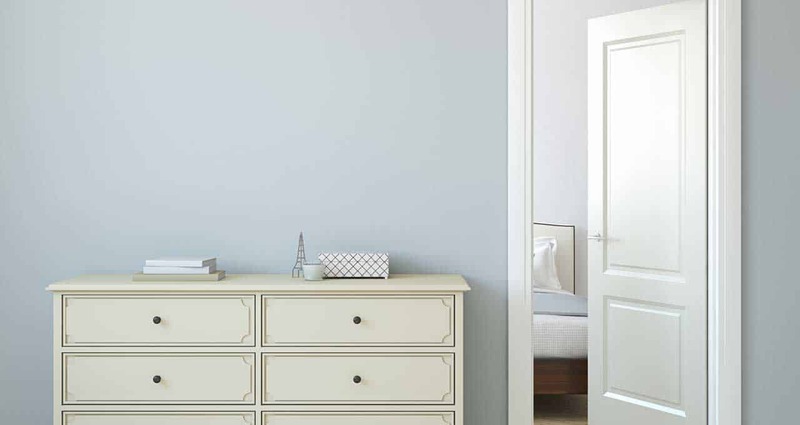 You can also mix completely different paint colors for a fun and interesting ombre effect. Do whatever works best for you… it’s your project after all! 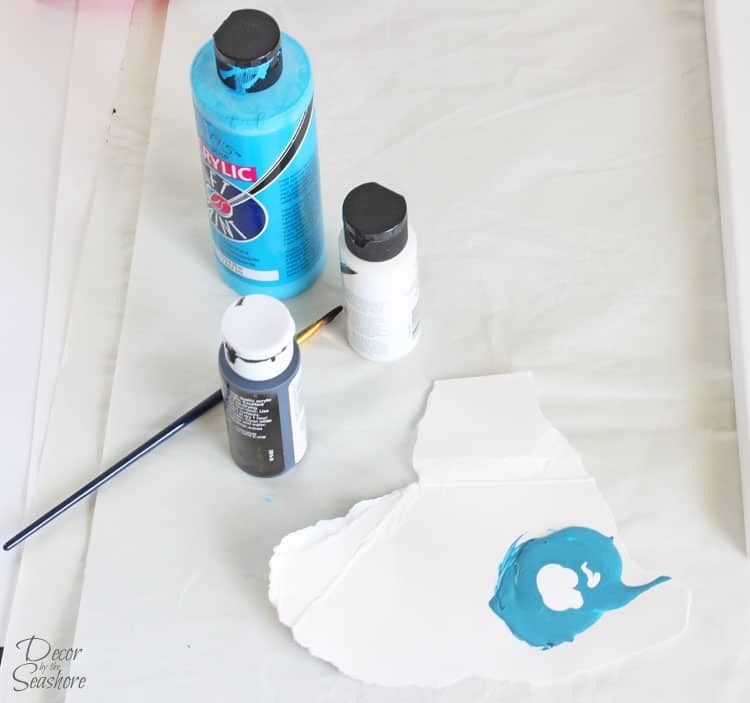 When you’re mixing paints, do it slowly one drop at a time until you get the color you want. 3. Paint your quote on the canvas. 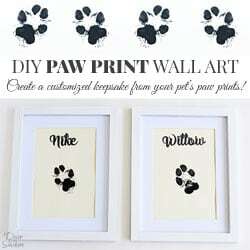 Fill in the letters with your paint brush, or if you’re free handing, go crazy! Don’t forget to clean your brush between colors! The best part of the project is stepping back to see the finished product. I have to admit, since I was so close to it while I was painting it, I didn’t really appreciate the full ombre effect until I had a chance to step back and take a look at it. It turned out pretty nicely, especially considering I am not one for doing freehand artwork! Not that this is really freehand or real art, but you know what I mean! I’m pretty happy with the way this turned out, so I’m going to be doing another DIY ombre canvas quote painting soon for another room in our house. I can’t help it now… I’m addicted! I got an amazing deal on a five-pack of canvases, and after using some to create photo canvases, I have a couple leftover for fun projects like this. So, how much do you love the ombre effect on this canvas? Are you tempted to make your own DIY ombre canvas quote? If you’re worried about hand painting, you can always do a test on a piece of paper first. 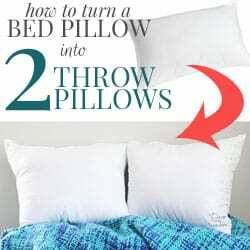 Personally, I just dove in head first, which is my crafting method 99% of the time. 😉 Crafting allows me to let my spontaneous side run wild and free, which is just one of the things I love about it. What’s your favorite thing about crafting? Let me know in the comments, and if you enjoyed this post, feel free to share it on social media. Don’t forget to sign up for my newsletter below to receive weekly crafty fun delivered right to your inbox! Oh I love this!! Looks so pretty in ombre shades!! 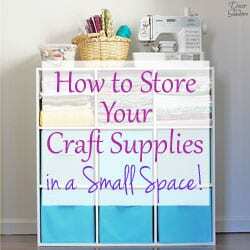 Thank you so much for sharing at my craft party on Thursday! 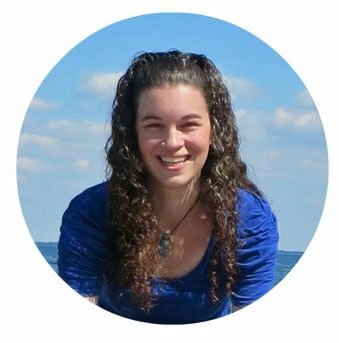 Would love to see your newest posts this week, which starts at 7pm EST. Thanks so much, Denise! I just love the ombre effect! I’ll be sure to stop by your link party next week! Love the quote and the ombre effect, Celeste. I wish I was good at free handing! Thank you so much for sharing it at Sweet Inspiration party! Thanks, Pili! If I can do it, anyone can! I cheated a bit with the outlining beforehand to make it easier! Thanks, Carol! It’s definitely so simple, and it turns out so lovely. 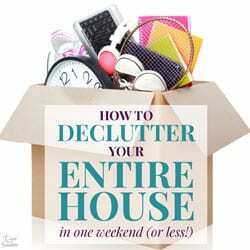 You should really give it a try! I LOVE it! Thanks for the post. That’s a beautiful quote, btw. Thanks so much, Gabrielle! I just loved the quote, and it was so appropriate for us being so close to the seashore that I knew it was the one I wanted to paint! Hi Celeste! I just love all of your ideas!!! 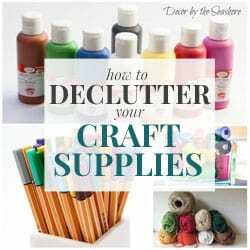 I have been using your decluttering tips, and now I see so many great ideas in crafting. You’re so smart and creative!! !